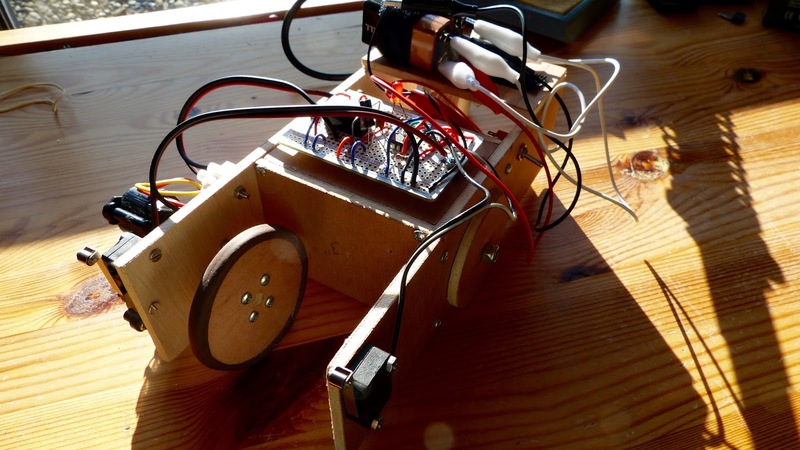 In my previous post about the robot cart I described how I finished the cart and tested the circuit on the breadboard. I only had to solder the circuit to the perf board and mount the board on the cart. Simple, right. Unfortunately it wasn’t that simple. After soldering I tested the board and discovered that there was a problem. The motor would spin and when I pushed the button it would reverse as intended however it never reverted to the original direction. I replaced several components such as the 555 chip but that didn’t help. When measuring the voltage on the pins of the 555 chip I found that it worked exactly as intended. I was mystified and beginning to feel desperate but then I recalled that there was an errata page on the book Make:Electronics. On this page I found someone describing the same problem that I had. Charles Platt the author of the book acknowledges the problem and possible solutions are offered. Searching on the internet for 555 timer relay I found a comparable schematic on cdelectronics.com. It basically adds two diodes to the schematic of the book (figure 5-98). One diode from the output of the 555 timer to the relay (to energise the coil) and a second across the coil. The result of this experiment. A finished, although somewhat improvised, robot cart. The electronics work great but the cart is susceptible to failure due to the alligator clips. It also runs way to fast damaging the switches while running into a wall. I added the two diodes to my board and tested it. I found that it works on 6V DC but barely. Due to the voltage drop on the first diode just 3.8V remains over the coil, just enough to energise it (for this specific relay: SRC-S-06VDC). If the battery voltage drops below 6V the coil is no longer energised. I therefore decided to use 9V DC block battery instead of 6V. This should provide a wide margin for operation without damaging the relay. NOTE: I found that other people such as +Virgil Machine were having good results with just a diode across the coil. Here is a link to his blog page. That didn’t work for me possibly to due the relay that I use. Next I’ll mounted the perf board (I used the handy half-size perma protoboard from Adafruit for this which I picked up for 4.95 euro) and the battery on the cart. I connected the the motor, battery and switches to the perf board. Then it was time to test the cart. The first test went miserably because the cart didn’t react to the switches. I then connected my bench power supply to the cart and it worked fine. I figured that the capacity of one block battery is insufficient to power the cart. I solved this by placing two block batteries in parallel which doubles the capacity of the power source. Testing the nearly finished cart with two block batteries in parallel. The block batteries are connected with alligator clips. The higher capacity was needed to power the circuit and the motor (which is very power hungry). With the power problem solved I made the last additions to the cart. I added an on/off switch and a glued a piece of plywood with velcro on it to the back of the cart. I attached the two block batteries to the velcro. Lastly I glued rubber to the front wheel to get more grip. While testing the cart I noted that it runs way to fast. I already damaged a sensor when cart hit a closet. Also the alligator clips come loose when the cart hits something. Nevertheless I feel I have nearly completed this experiment. I’ll probably replace the motor for one with lower RPM (and a less power hungry one). The perf board attached to the top of the cart with two bolts and nuts. Note the two diode are added to the circuit. It doesn’t look pretty with all those wires but it works. The batteries are attached to the cart with velcro. 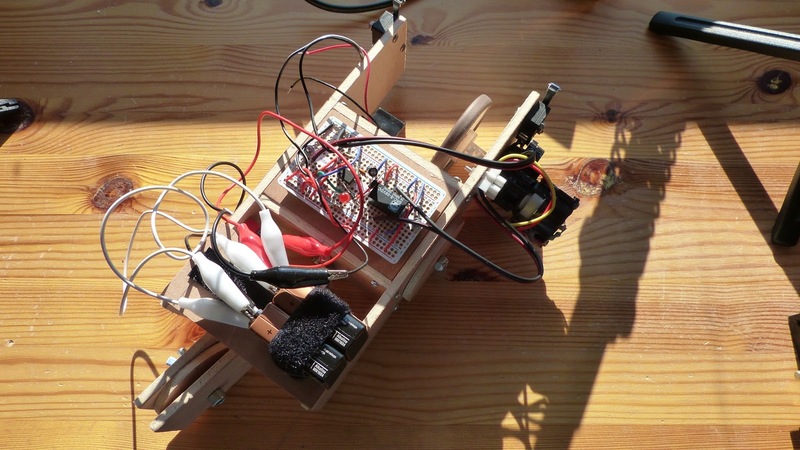 Side view of the robot cart. A piece of plywood is added to the back of the cart to accommodate the batteries. I glued rubber to the front wheel of the cart to increase traction. The other side of the finished robot cart. 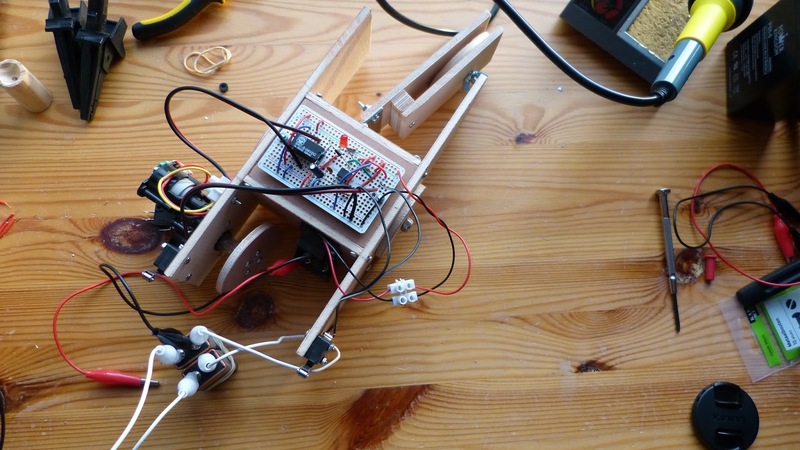 This experiment is about building a little robot cart. 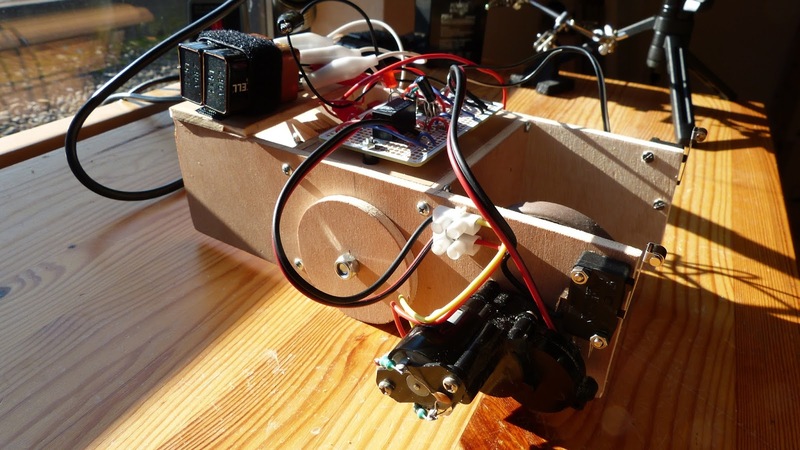 Make:Electronics describes all the steps that needs to be taken in great detail beginning with the cart and then the circuit. This experiment is a lot of work but I think it is worth it because you make a complete robot from the bottom up. The cart is much smaller than I initially thought and making small things brings their own set of problems in terms of precision and tools needed. The cart needs a motor and I salvaged one from an old RC car that was lying around in the house. For this project I use a 6V DPDT relay. I decided to make the circuit first. I had some problems with the relay because the switch is connected differently than the one used in the book. Luckily this was easily solved by looking at the datasheet of the relay. I tested the motor on the circuit and it worked well. The cart made out of plywood with a motor that I salvaged from a old RC car. I grinded away some unnecessary parts of the housing of the motor. Next I created the cart. I made the cart of 1/4″ thick plywood and not the ABS material that is suggested in Make:Electronics since I have no experience with ABS. I cut the plywood and connected the pieces with screws and bolts and nuts for the wheels. The cart looks pretty good (I think) and maybe a good platform for further experiments. There are two potential problems with the cart. First the wooden wheels lack grip. Maybe I’ll cover the surface of the wheel with rubber tape to overcome this. Second the motor is spinning fast maybe too fast for the cart. The cart might crash because of this. This could be solved by adding some gears to the motor but that would complicate things. For now I will just wait and see what happens once the cart is finished. Next I will solder the circuit on a piece of perfboard and fit it on the cart. The book describes the principle of limit switches to create a better steering mechanism (p278). The author doesn’t describe in detail how to add this to the robot cart but I might be a nice addition to this experiment. Circuit of the robot cart with a 555 timer triggering the relay. The motor is reversed when the relay is energised. The LED indicates that the 555 timer is triggered (by the switch). With the trimmer sets the length of the 555 pulse The pin lay-out of the relay is different from the ones described in Make:Electronics (p58). Overview of the cart. The hinged trailing wheel is not yet connected to the cart. During experiment 29 and 30 of Make:Electronics I noticed that the circuit were very susceptible to noise to the point that it really interfered with the experiments. While thinking about it I suspected that something was wrong with the breadboard. I decided to redo both experiments with a another breadboard (but without the low pass and high pass filter). I immediately discovered that the sound was more clear than before. I also discovered that at 9V the circuit only took 40mV whereas the same circuit on the old breadboard took 200mV. A clear sign that the old breadboard was malfunctioning (possibly due to a burn-out). 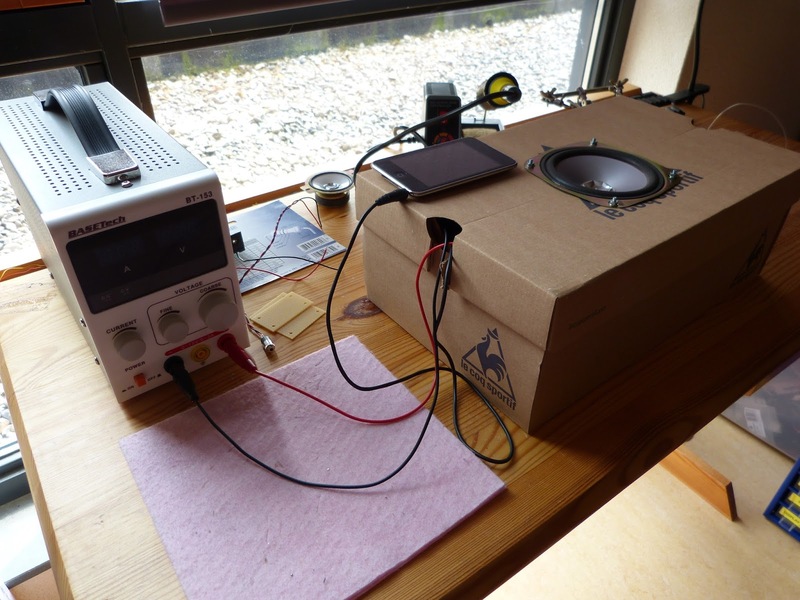 Previously I wrote about the TEA2025B amplifier becoming very hot. So hot that I decided to reduce the voltage of the circuit from 9V to 4.5V. 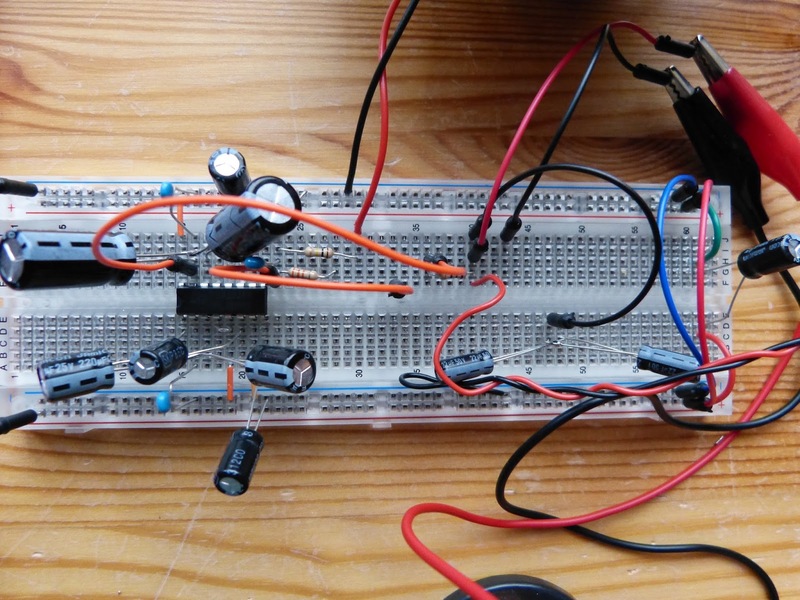 The same amplifier in the current breadboard is not hot at all even at 9V! Not surprisingly since the heat generated by the amplifier is proportional to the square amperage. The lesson here that when that even the unsuspected elements can be a variable in experiments. Redoing experiment 29 and 30 on another breadboard was worth. 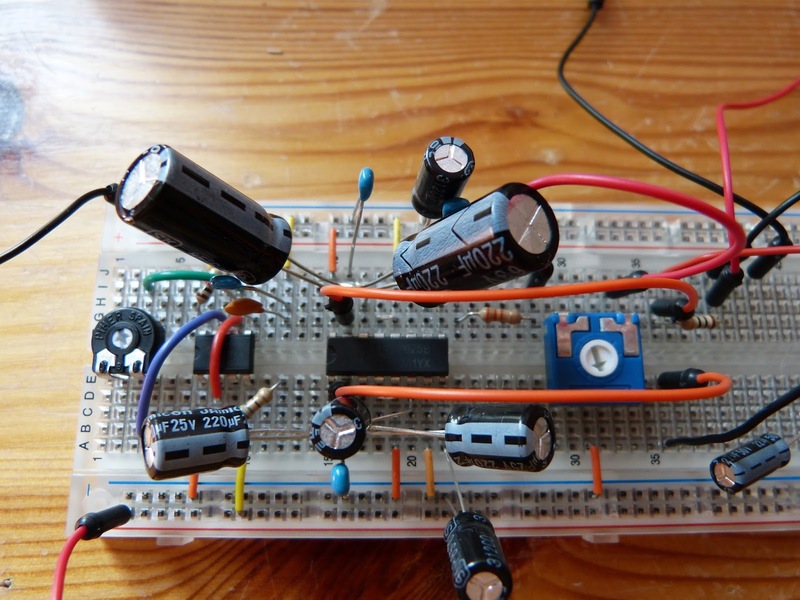 At 8,9V the circuit only needs 40mA. Not only did I get rid of all the noise also the circuit needed only one fifth of the amperage. Visible on this image is part 2 of experiment 29. Closer look at the breadboard with on the left the 555 chip with a black and blue trimmer surrounding it. On the right the TEA2025B amplifier. 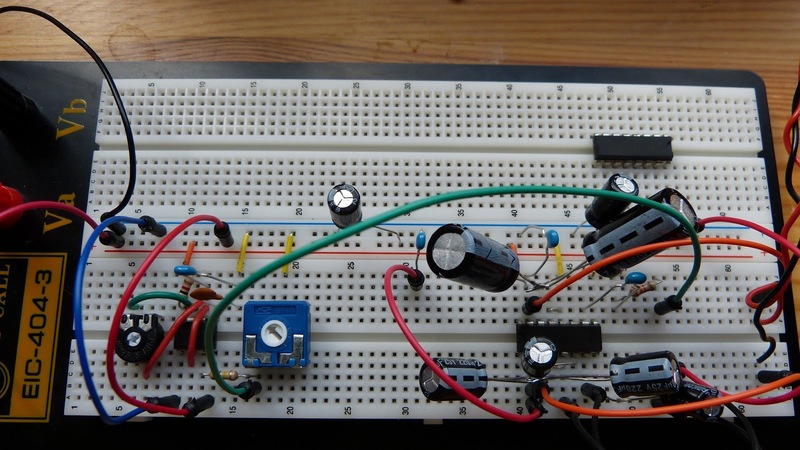 The circuit on the breadboard is same as the shown in figure 5-41 of the book without the low and high pass filter. 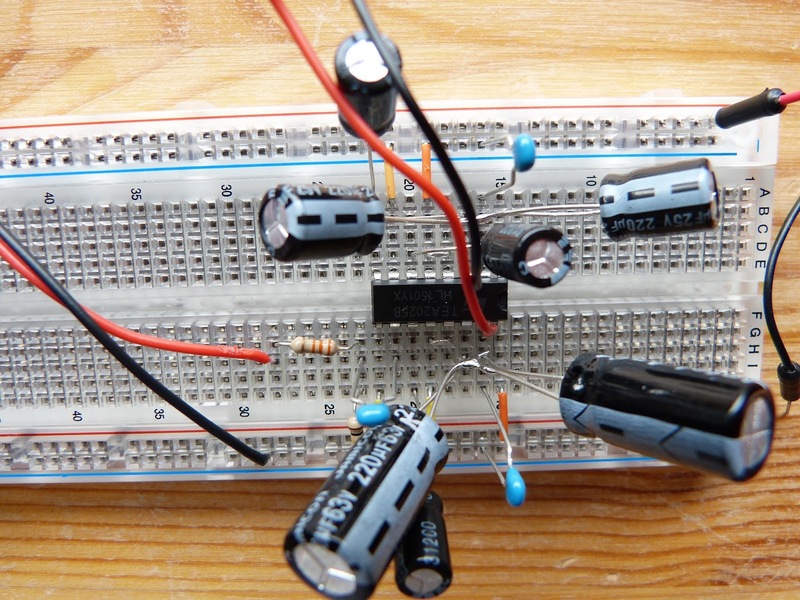 Building the circuit is easy enough since I could use most of the circuit from experiment 29. The most important change, besides some resistors and capacitors, is the addition of two 2N2222 transistors. For the output adjustment of the transistors I used a 50K potentiometer instead of a 100K. Trouble began when I tested the circuit. 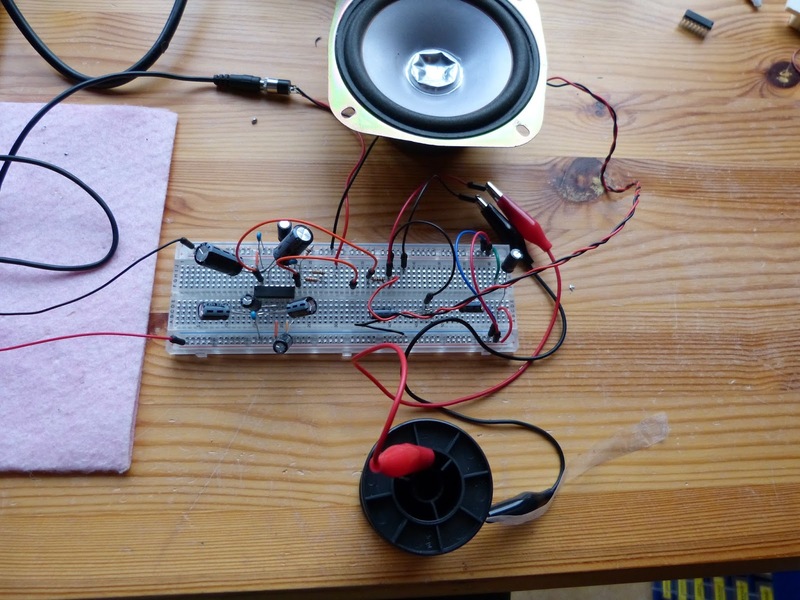 Amplification of the audio input worked fine (although the circuit is susceptible to noise) however I couldn’t get the distortion to work. I determined that the 555 chip was working fine but couldn’t get a signal on the base of the first transistor. I switched the two transistors with each other to no avail (these are the last in my stock). When I came back to the circuit a little later I noticed that the voltage was very low (about 5V). I had done that on purpose when I initially tested the circuit not wanting to overheat the amplifier but I hadn’t increased it afterwards. I increased the voltage to the required 9V and suddenly I had a beautiful harsh distortion coming out of my speaker (which annoyed my oldest son slightly since he was doing homework on the same floor). Next I’ll play around with some capacitors and resistors to change the distortion effect. 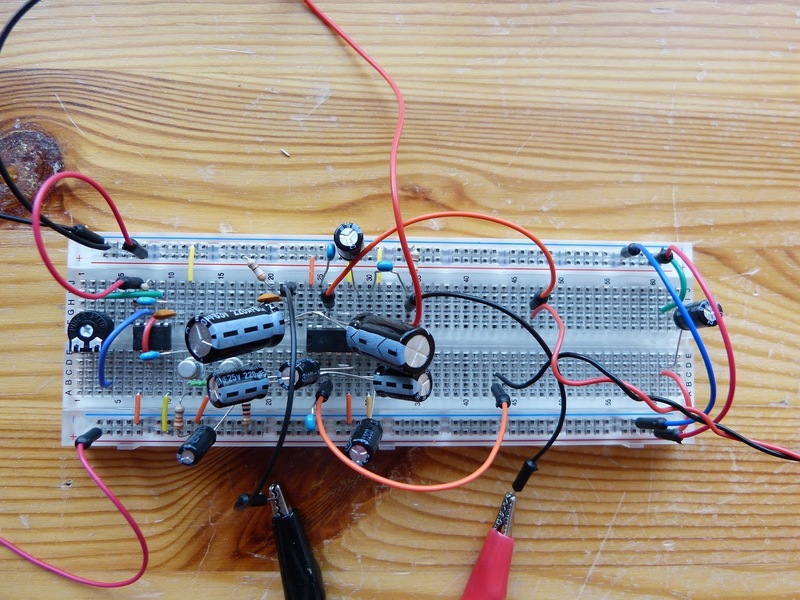 Overview of breadboard with 555 chip on the left and the amplifier on the right. In between them two 2N2222 transistors creating a distorted sound. The wires to the right are connected to the speaker and wires to the top provide audio input. Not captured is the 50K potentiometer (connected to the alligator clips). It adjusts the output of the transistors. A closer look at the two transistors. At the top is the audio input visible. I finally reached the second stage of Experiment 29 of Make: Electronics. In the first stage I used an audio amplifier (TEA2025B) and a coil to create a crossover network. During this first stage the source of the audio was an iPod (read here). In the second stage the iPod was replaced by a 555 timer as described by figure 5-51 of the book. In the astable mode the 555 timer generates a square wave. This square wave is led to the audio amplifier. A 100K trimmer between pin 6 and 7 is used to change the frequency of the square wave. The output of the 555 chip (pin 3) has, besides a 680K resistor, a trimmer connected to it. This trimmer is to be used to control the volume. Circuit used for this experiment. The cardboard box proved to be a good box for this experiment. It has a 4-inch speaker built-in. Just in front of the soldering iron is the coil creating a low pass filter. Contrary to the book I used a 220 ohms resistor on pin 3 instead of the 500 ohms (which I didn’t have). Because of the problems with the high temperature of the TEA2025B (read here) I used a voltage of 7V instead of 9V. The circuit is functioning great and with the 100K trimmer I was able to change the pitch. The square wave that is generated makes a harsh somewhat unpleasant sound. The final part of this experiment the low pass filter and the high pass filter will be used (again). I will describe that in my next post but that won’t be until the end of July. Today my summer holiday has started and I will be gone for a couple of weeks. UPDATE: I used the low and high pass filter. Not surprisingly the low pitched sound generated by the 555 chip is passed on much better by the the low pass filter while the high pass filter generates hardly any sound at all. Reversely the high pitched sound is passed on by the high pass filter while it is hardly audible through the low pass filter. This concludes experiment 29. 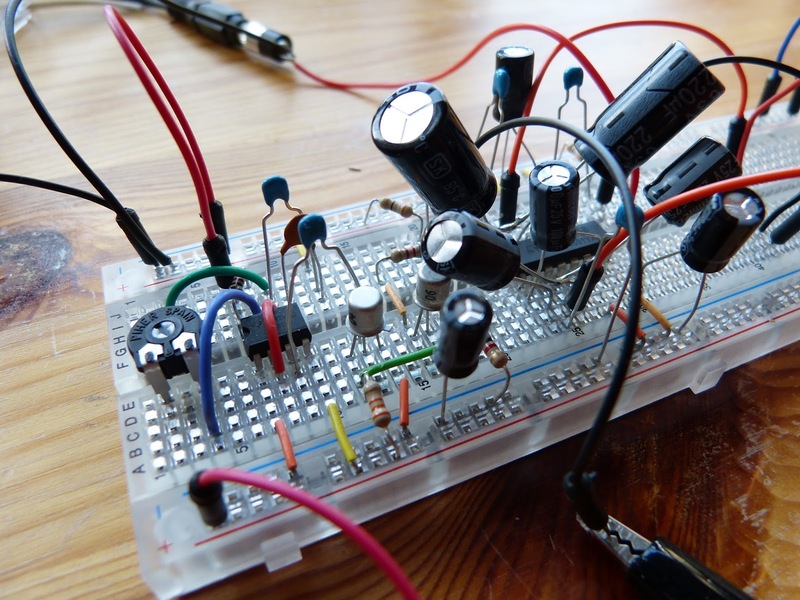 In experiment 30 this circuit is used once more to demonstrate and audio distortion. 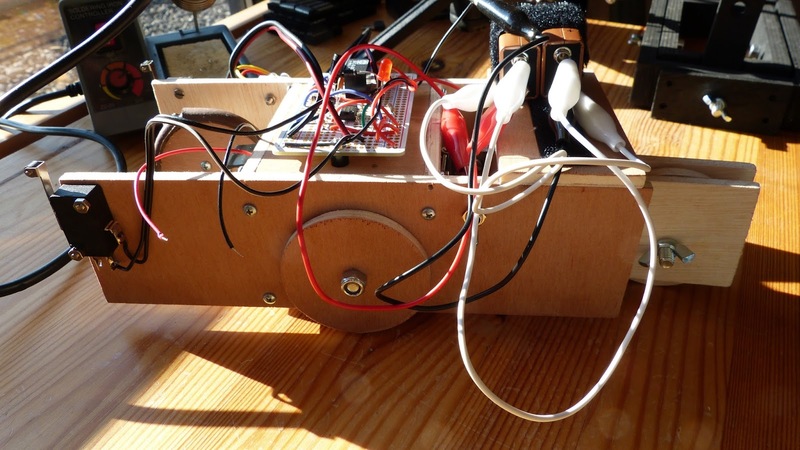 A closer look at the breadboard with on the far left the 100K trimmer. Next to it the 555 timer in astable mode. In the middle the TEA2025B amplifier and on the right the blue 220 ohm trimmer. A small update on the filtering experiment 29 of Make: Electronics that I wrote about earlier this week. To improve audibility especially of the lower frequencies I had to built an enclosure. The book proposes a plastic box but I had a shoebox made out of cardboard lying around. I cut a circular hole in it just wide enough to fit the 4-inch speaker and fastened it with four bolts and nuts. 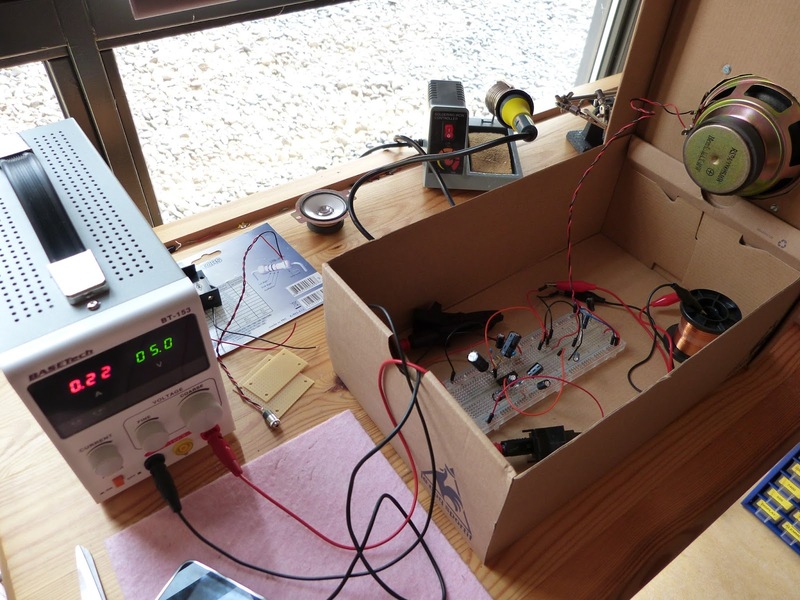 I placed the breadboard with the amplifier on the bottom of the shoebox. 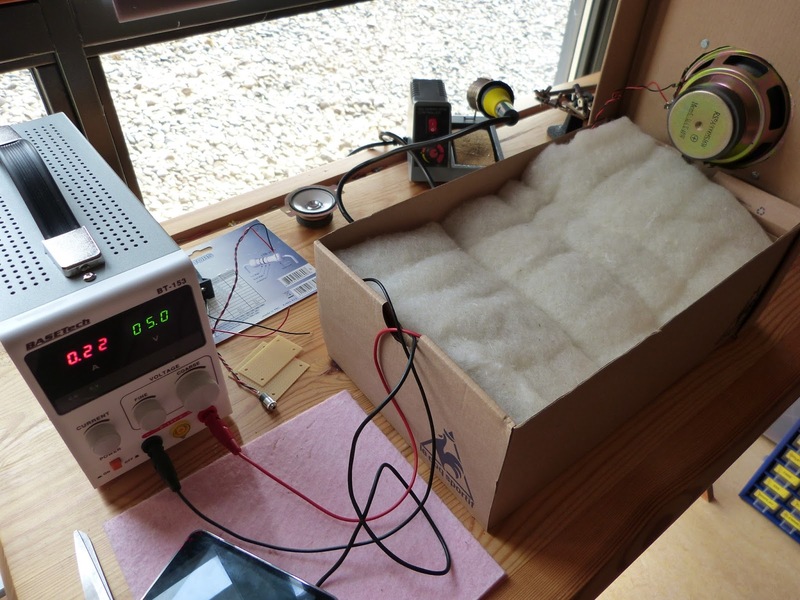 I connected the audio and power and filled the box with isolating material. Then I played a track unfiltered, with low pass filter and with high pass filter. The box definitely made an big improvement to the sound. Conclusion: a shoebox can make a tolerable (and cheap) enclosure for a speaker. 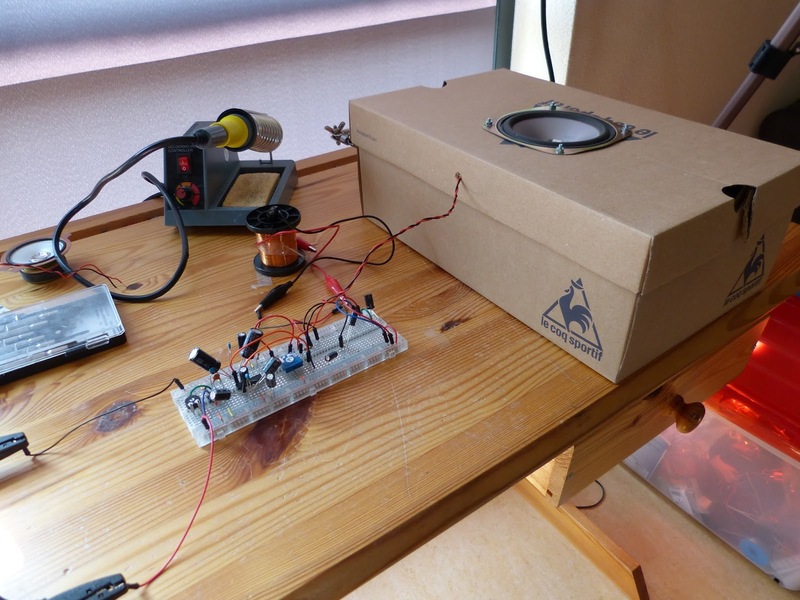 Cardboard box with speaker built in. Labbench and iPod for power and audio-in respectively. Breadboard on the bottom of the shoebox with the coil clearly visible. The coil acts as a low pass filter. Shoebox stuffed with isolating material in an attempt to improve the sound for this experiment. Finally, after earlier setback, I’ve got the amplifier and 4-inch speaker working properly. I tried multiple setups today and managed to get rid of the distortion. The book dictates 9V, 33K resistance on audio input. This results in my case in a temperature of 90 degrees (194 fahrenheit). Which is uncomfortably high. I therefore decreased the voltage to 6V DC, increased the audio input resistance to 100K and added 10 ohm resistance to audio output. This gave a workable temperature of 60 degrees (140 fahrenheit). Because of these high temperature it is likely that the TEA2025B amplifiers that I bought for this experiment are part of a rejected batch. After having solved this problem I added the coil, as a low pass filter, and the 11 uF bipolar capacitor as a high pass filter. Both filters work great with low frequencies on the low pass filter and high frequencies on the high pass filter. The coil is the same that I used in experiment 28 and the bipolar capacitor was made of two 22uF electrolytic capacitors. Next I’ll fit the speaker in a shoebox and create a waveform with a 555 chip as an input for the audio amplifier (instead of the ipod). 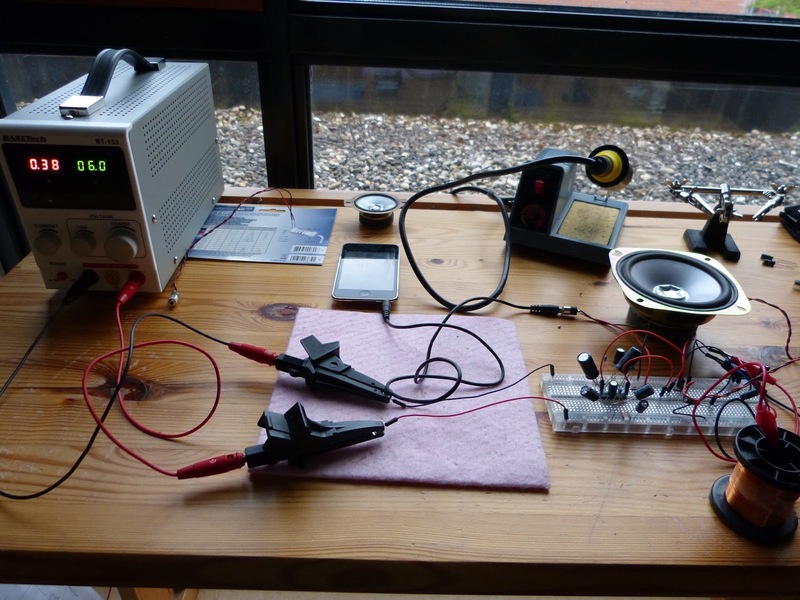 Overview over the experiment with on the left the power supply, in the middle the ipod and on the right the breadboard. Close-up of the breadboard with on the left the TEA2025B amplifier. 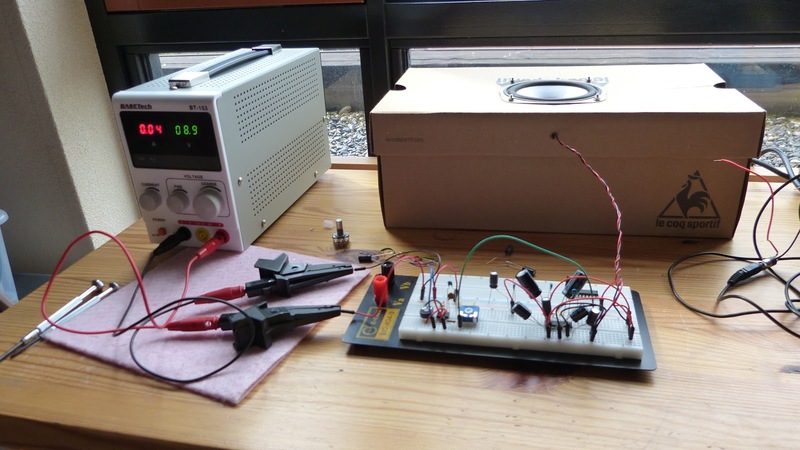 This experiment of Make: Electronics demonstrates the use of self-inductance and capacitance in audio filtering. The low and high frequencies of the audio signal can be separated and send to different speakers (woofer and tweeter). The audio chip used for this experiment is the TEA2025B, a somewhat older chip that was used in portable radio cassette players (remember the Sony Walkman). For this experiment I needed a 5-inch speaker. I was able to find an old woofer that came from an sound system that’s no longer in use. This particular woofer is 4 inch , 6 ohm (according to the book a minimum 5-inch and 8 ohm speaker is required) and maximum of 40W. I made the two nonpolarized capacitors out of two 220uF capacitors as indicated in figure 5-38 of the book (pg. 249). The experiment requires two .15uF electrolytic capacitors which I do not have. I use two 100nF ceramic capacitors instead. I have build the circuit temporarily without filtering for two reasons. The first reason is that I want to use this circuit to test the TEA2025B’s that I bought from Aliexpress which were in a very bad shape when they arrived. Secondly I want to rule out problems in the non-filtering part of the circuit. Overview of the experiment. With on the left side the 4-inch speaker. The audio is supplied by a Nexus 7 inch tablet. My first try didn’t go so well. After powering up the circuit the first half minute or so the sound is sort of ok but than a terrible distortion kicks in and makes listening unbearable. Furthermore the TEA2025B becomes extremely hot. I unplugged and checked for errors but couldn’t find none. I figured that I’m overdriving the amplifier so I increased the 33K and 10K resistor to 100K and 33K respectively without result. I then changed the TEA2025B for another one, again no result. Finally I decreased the voltage to 4,5V (instead of 9V). Now the distortion is gone but I’m still not happy with the sound quality. The sound is very muffled and undefined (sorry I don’t have any words to describe it). Not sure how to go forward from here. 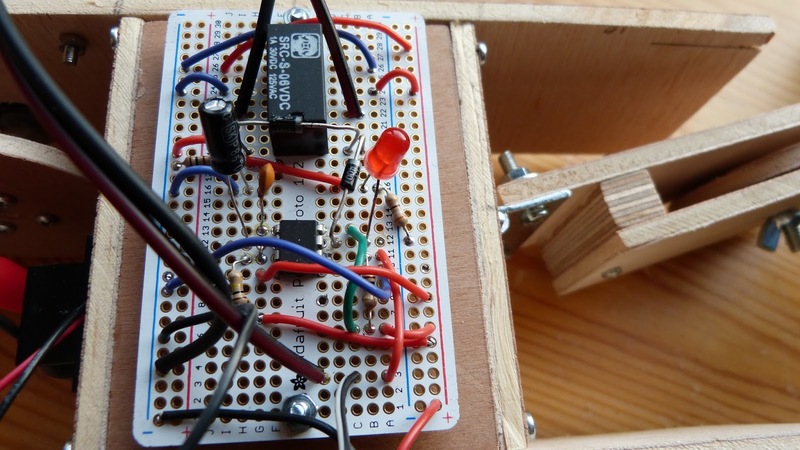 Close-up of the breadboard. The oddly shaped capacitors are the non-polarized capacitors that I made from 220uF capacitors. 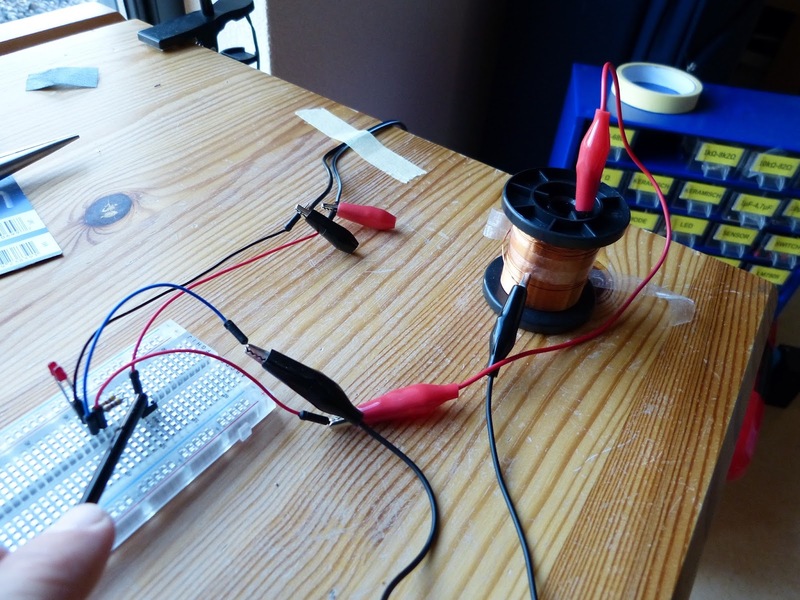 After making an improvised coil (experiment 25) and cutting a coil out of a speaker (experiment 27) in this experiment the self-inductance of a coil is demonstrated. 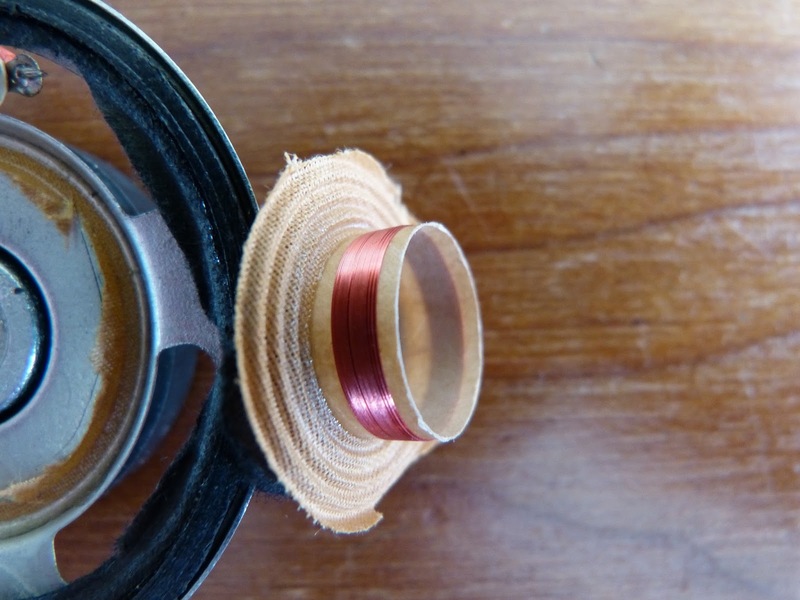 As a coil in this experiment I used 44 meters of coated copper wire on a spool. In parallel with the coil two low current LED’s are connected. The polarity of one LED is opposite to the other. In the Make: Electronics book a 220 ohm (rated 0.25 watt or higher) resistor is used. Instead I used to two 470 ohm resistors in parallel (this totals to 235 ohm resistance) to protect to resistors and more important my breadboard. After pressing the button (without releasing it) one LED lights up briefly. Releasing the button prompts the other LED to lights up briefly. 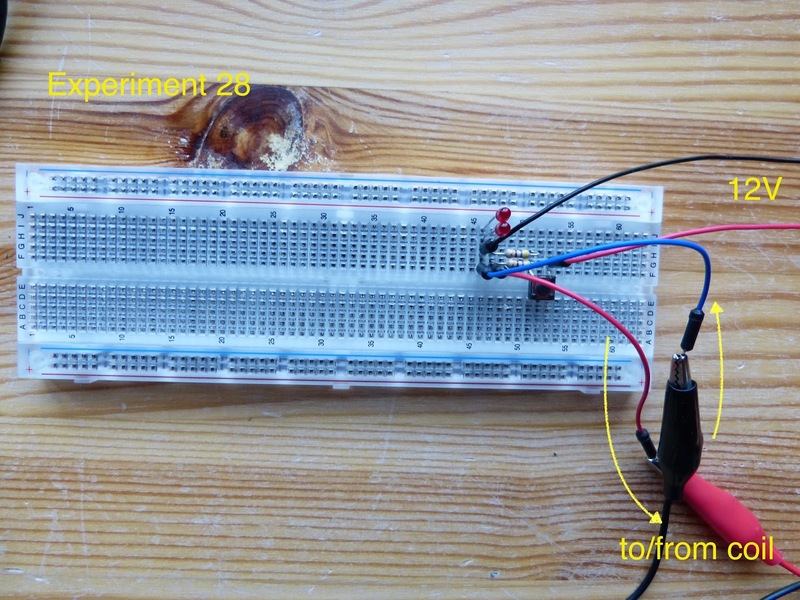 This experiment demonstrates that the coil opposes any change in current first by blocking the current and forcing the current to pass through the first LED and then, when the button is released, by releasing it’s stored energy over the second LED. All components on the breadboard. Two 470 ohm resistors in parallel were used to counter for the 1/8 watt resistors that I use. Experiment in progress. On the right the 44mm copper coated coil. I couldn’t get the cylindrical neodymium magnet of the required size so I skipped experiment 26. 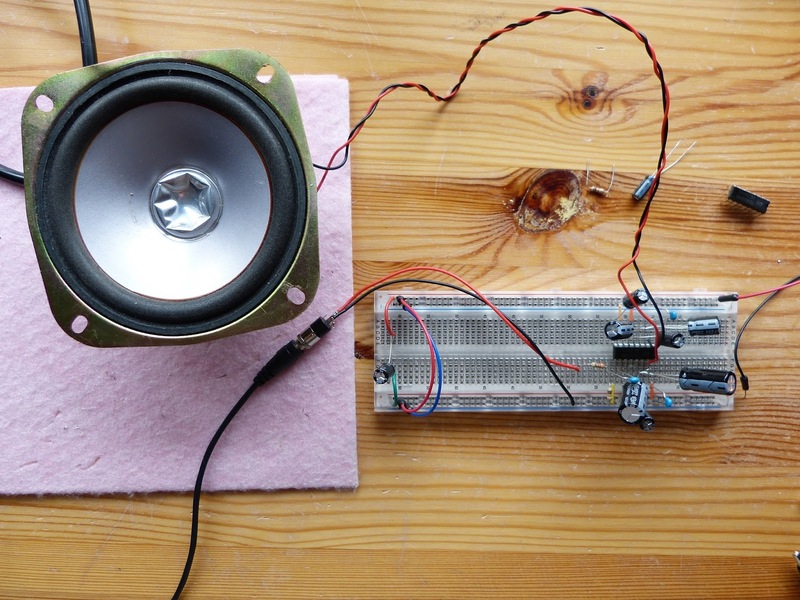 Next experiment 27: Loudspeaker Destruction of Make: Electronics is a very simple and very short experiment but worthwhile nevertheless. 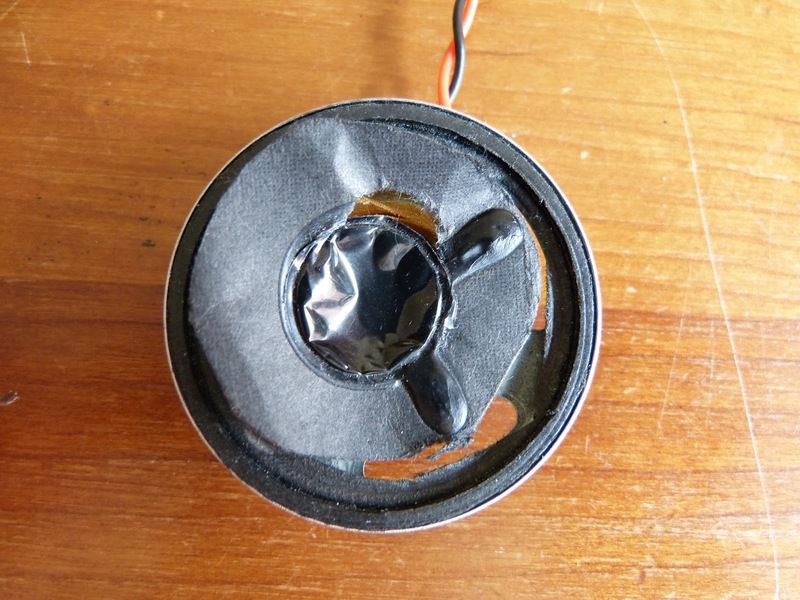 It demonstrates how a loudspeaker works by literally cut it to pieces. Luckily I had an old 2 inch speaker lying around from a broken alarm clock. Something keeps me back in destructing brand new components. First the black paper (the diaphragm) at the front facing side of the speaker is removed by cutting a wide circular piece out of it. A flexible yellow fabric (the spider) becomes visible. Now this yellow fabric is cut out in a wide cirkel. When the yellow fabric is pulled out of the speaker it contains a coil on a plastic cilinder (the coil former). The coil on the plastic cilinder is placed between a static inner and -outer magnet. When an (varying) electrical current is going through the coil a (varying) magnetic field is created. This varying magnetic field interacts with the magnetic field of the static magnets forcing the coil and the fabric and the black paper to move up and down creating sound waves. 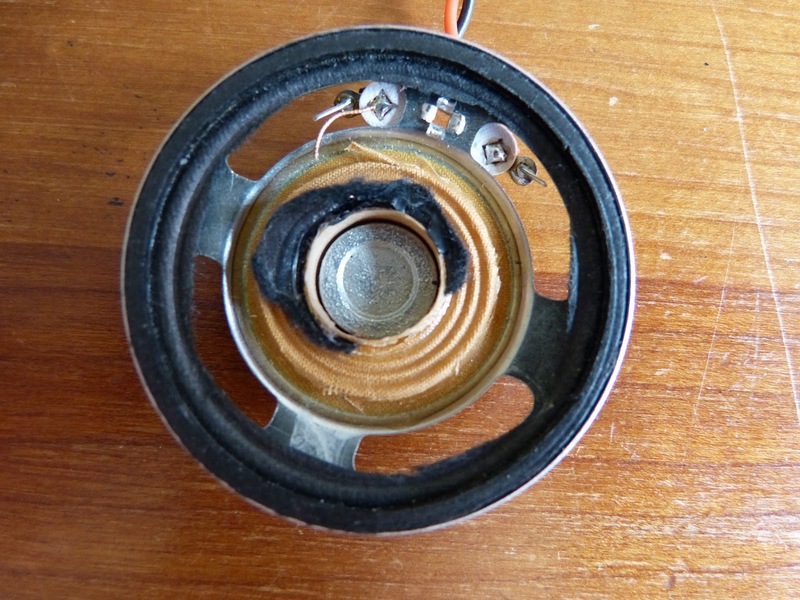 There are many images and videos on the internet to illustrate how a speaker works but I discovered that none of them is as instructive as taking one apart yourself. The black paper (diaphragm) of a 2 inch speaker cut out with an X-Acto blade. The flexible yellow fabric (spider) cut out of the speaker. A left over of the diaphragm is visible on the spider. The spider pulled out of the speaker. 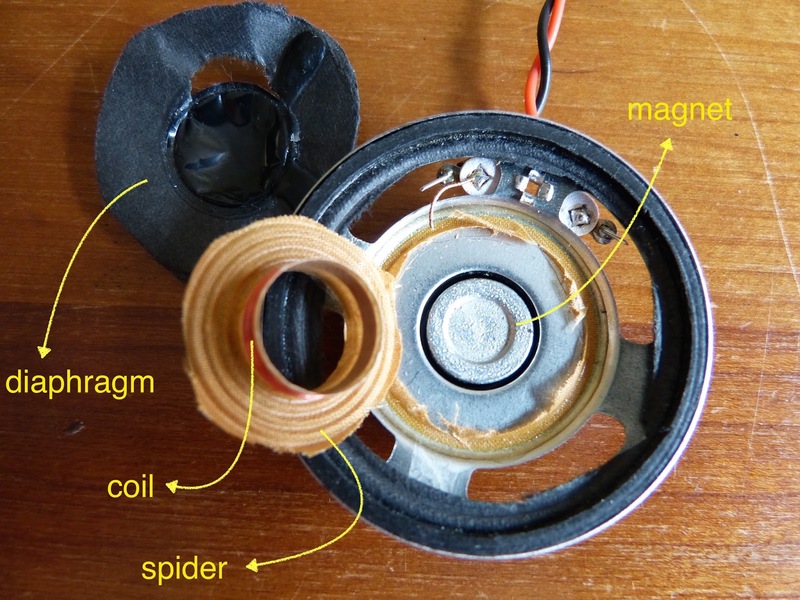 On the inside of the spider a coil becomes visible. The coil fits right between the two magnets of the speaker. In the centre of this image the yellow fabric with the coil, a very fine copper wire wound around a plastic cilinder.